As we speak one of my customers is looking into using Azure Network Watcher for its network auditing and packet logging capabilities. Network Security Group flow logs are a feature of Network Watcher that allows you to view information about ingress and egress IP traffic through a Network Security Group. While flow logs target Network Security Groups, they are not displayed in the same way as the other logs. Flow logs are stored only within a storage account. The big challenge to enable NSG flow logging is that you have to do it one by one in the Azure portal. A step-by-step guide on how to do this is described here. You need to select the NSG, tick the box to enable NSG flow logging, specify a storage account etc. This is going to take ages to enable for all my NSG’s! For my customer, this wasn’t going to work as they have a lot of NSG’s defined in their environment. 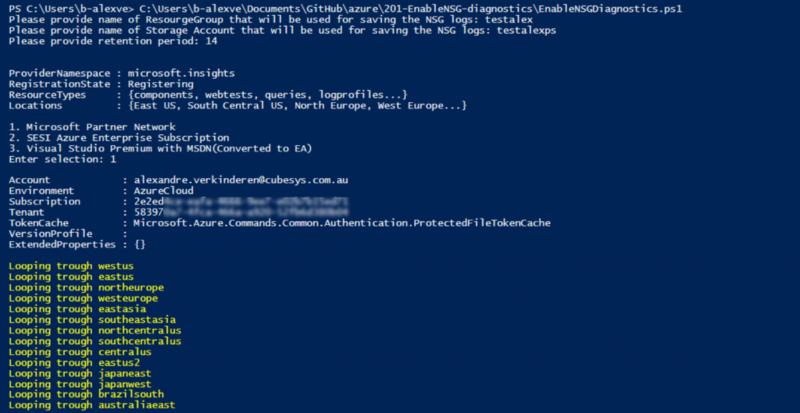 This blog post will cover how you can enable NSG flow logs for all your NSG’s at once with a PowerShell Script. This scenario assumes you have already followed the steps in Create a Network Watcher to create a Network Watcher. The scenario also assumes that a Resource Group with a storage account has been pre-created. In order for flow logging to work successfully, the Microsoft.Insights provider must be registered. The script will register the provider. In the next blogpost I will cover how to visualize this data with PowerBi.